We have 36,000 square feet of production space and currently employ 46 people. Our convenient location allows us to be serviced by all major freight carriers. We also provide direct local delivery services, in most circumstances. Our typical iron grades are Ductile 65-45-12 and 80-55-06, and Gray Iron Classes 20, 30, 35 and 40, though other grades are available on a case-by-case basis. Our typical casting weights range from 1 ounce to 500 pounds. 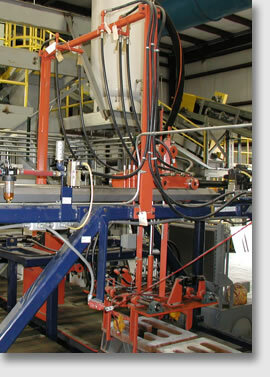 Our molding facilities consist of a Roberts-Sinto FBO III automatic molding machine capable of 20x24 tooling. Adapter plates for off-sized tooling is available. Three squeezer lines with flask sizes ranging from 13x13 through 20x20. We also operate one Cope and Drag Floor mold line with flask sizes ranging from 24x24 through 30x30. A Beardsley and Piper 85B Speed Muller supplies the green sand for the Sinto. The sand is tested for quality by a Hartley sand control system. Additionally, an International Molding Machine automatic mold handler handles our molds. Castings are cleaned in a Didion Rotary Drum Media Cleaner and finished in a Wheelabrator Short Blast Cleaner. We have stand grinders for most parts, and table grinders for larger parts. Melting facilities consist of two Inductotherm induction furnaces. PC-based chemistry testing is done in-house with outside independent evaluation done daily on ductile chemistry and physical properties to ensure compliance to published standards. Certifications are available upon request. To meet your machining needs, we have a shop utilizing the latest CNC equipment, as well as conventional machining equipment. We also have the ability of outside tooling and plating, if the need arises. Give us a call. We would like to have an opportunity to establish a relationship with your company.